Our Heavy Gauge Two Celtic Band Tall One Pint Pewter Tankard measures 5.51 inches tall by 3.54 inches wide. 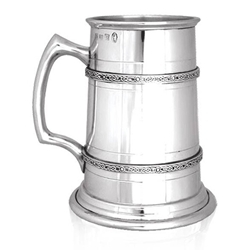 This is a heavy weight one pint pewter tankard, that perfectly combines substance and style. Composed of thicker gauge metal, the 14cm tall tankard feels significantly heavier than standard tankards, but still will remain tarnish free for years to come. The stylish element of the tankard is produced by the horizontal line detailing, beautiful nouveau style handle and most notably by the intricate Celtic style bands that run around the circumference of the tankard at the top and bottom of the body.